One of summer’s great pleasures is sitting comfortably out on the deck, cold drink in hand, and talking with friends on a warm evening. One of the easiest ways to make your own deck? Snap-together tiles that rest right on the surface of your yard. 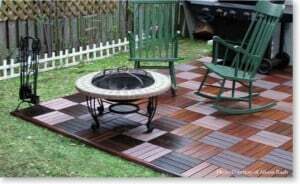 DIYPatioDeck.com stocks Deck ‘n Go and Multi-Snap Tile systems, with materials that range from fir, plantation teak and eucalyptus, to porcelain and slate. They’ve even got composite wood tiles made from recycled materials. The Deck ‘n Go product includes a “Perfect Edge” system, giving you “exact-matched,” professional-looking edging and corners for your patio. A deck like this can last for years, holding furniture and umbrellas. Or — and this is its beauty — it can put down for one-time celebrations like barbecues, graduations and birthday parties. (I’ve even seen a wooden temporary ‘floor’ for dancing out in the moonlight at a wedding!) Once your party is over, stack the tiles in a convenient corner of your yard for the next event. You can even move your deck with you if your house is sold. Provided, that is, the new owners don’t want to keep this useful and beautiful feature for themselves. Great post and also an opportunity to discuss how a home equity line of credit can help with home improvements such as adding a deck or other additions to the house. Many times people use a home equity line of credit (HELOC) for just such projects, especially when the project calls for a large amount of funds.